Shelves help students stay organized. Helping students learn to organize their academic materials and supplies can be a challenge, especially since teachers have to maximize the limited space they have in their classrooms. Strategic filing systems and visual cues can help students keep track of their assignments, so they finish projects on time. Without effective organization techniques, students will likely lose assignments, forget to do homework and feel frustrated because they can't get their work done efficiently. Organization also provides structure, so teachers are less likely to feel overwhelmed by a frequently cluttered work environment. Labeling storage containers, in-and-out assignment trays, academic materials and art supplies makes it easier for students to find what they need. It also helps the classroom stay orderly, so students know where to put things when it's time to clean up. Creating and labeling a homework or assignment section on your chalkboard or white board, allows students to visually see what they need to accomplish. By the end of the day, students may not be able to recall what they covered in the early morning hours and it will help them remember what books or folders they need for homework. Assigning a single-digit number or a letter of the alphabet to each student at the beginning of the school year makes it easy to sort materials and classwork. Print stickers of the student numbers and place them on textbooks, folders, supplies, pencil boxes, graded assignments and incomplete assignments. Teachers can use the numbers to quickly enter grades in the grade book, sort assignments, locate missing papers, take attendance and record behavioral issues. If students write their number or letter in the top right-hand corner of every assignment, you can thumb through them quickly. This organizational technique is especially useful when you have fire drills or encounter emergency situations; calling out the numbers or letters can quickly identify students who are missing. Students thrive in a consistent classroom environment, so creating and following a daily or weekly schedule helps them stay on task. This strategic organizational technique also helps students plan and prepare for what's coming next. For example, students can learn not to get art supplies out on Tuesday or Thursday mornings because they have physical education in the gym. Students can get their math books out before recess because they know it's the next subject once they return. As a teacher, you can mix things up from time to time to provide spontaneity and encourage creativity. However, creating a consistent schedule will help your students maintain a systematized routine for the average school day. Establishing an attention code gives students a cue to listen and respond to your instructions. For example, you can flip the lights off when you want to get their attention. You can say "Hershey" and have your students reply "Chocolate," or you say "Chicka Chicka" and your students reply "Boom Boom." These call-and-response attention codes alert students to stop what they're doing and listen. They are especially beneficial during lunch time or recess when your class is intermixed with other classes. 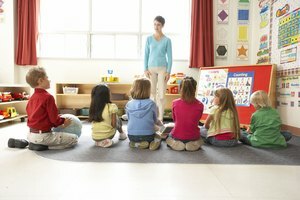 It also helps in noisy classroom settings when students are working in activity centers and you need to give instruction. Once students get used to a daily schedule, attention codes also serve as an automatic reminder to clean up supplies or get textbooks and folders ready for the next academic subject. Tucker, Kristine. 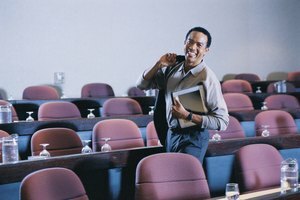 "Student Organizational Techniques for the Classroom." Synonym, https://classroom.synonym.com/student-organizational-techniques-classroom-5775.html. 26 September 2017.